Hello. 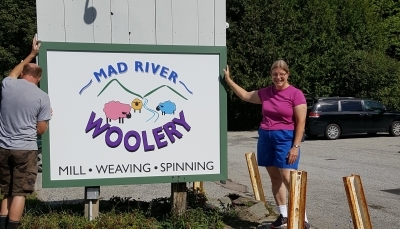 Welcome to Mad River Woolery. Since our opening in October 2016 there has been a whirlwind of activity around the mill. Learning how to use and maintain the equipment, implementing work processes (so we don’t lose track of your fiber!) and getting our retail shop in shape. We purchased a building at 6163 Main Street in Waitsfield, Vermont, which had been various restaurants for over forty years. We renovated the south side of the building which housed the kitchen and dining area and leased out the north side to Cris Peck and Jason Neimark who recently opened Shepard’s Pub. You can visit the Woolery get your fiber fix and hop next door for lunch or dinner. It has been fun to see the reaction of the locals who are curious about what we have done with the space. No one is quite prepared for the scale of the operation or the machinery we have and many reminisce how they worked as a waiter or in the kitchen as teenagers or during college. Business has been booming since we opened. Custom work is currently about four months out. We invite you to stop by during shop and mill hours. Stay in touch.